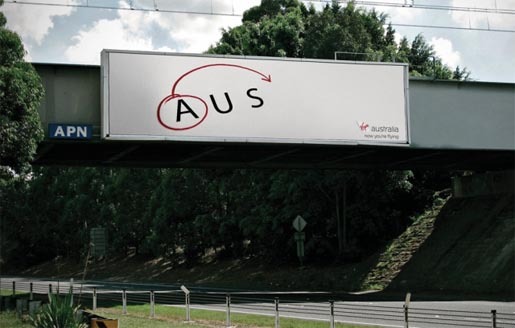 Virgin Australia promoted its long haul flights from Australia to the United States with a billboard featuring the close connection between the two countries’ abbreviations. Just move the A from the beginning to the end and you’re there. “From AUS to USA. Virgin Australia. Now you’re flying.” The billboard won a Gold Outdoor Lion at 2012 Cannes International Festival of Creativity. The AUS to USA billboard was developed at Clemenger BBDO, Sydney, by executive creative director Paul Nagy, creative director Luke Chess, copywriters Ryan Albuino and Josh Braithwaite, art directors Andrew Chu, Sebastian Vizor, Sarah Parris, Michael Dole, illustrator Ben Greenfield, photographer Nick May, account supervisor Chris Yong, account manager Kevin Doyle, account executive Grace Kluver, producer Steve Tindall and head of production Chris Bear.